Hi there! Today I”m helping get the word out on a contemporary YA romance from Ms. Monica Murphy. 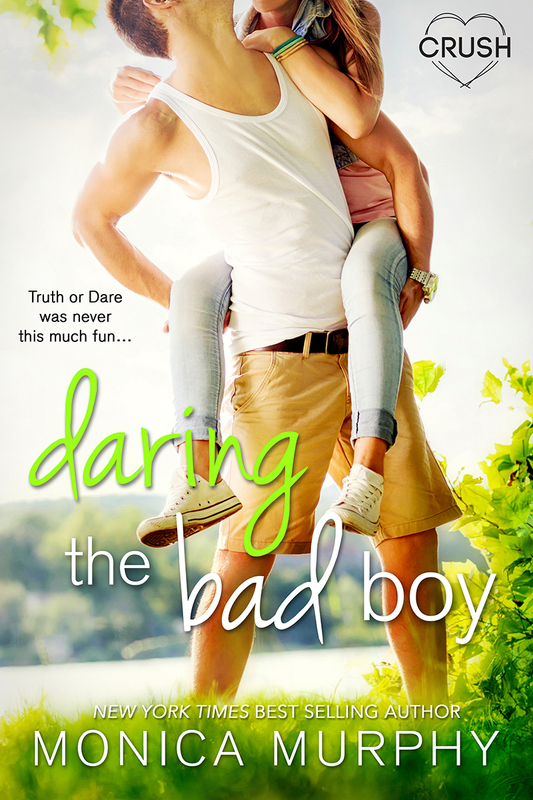 I’ve liked some of her books in the past, GAME FOR MARRIAGE and GAME FOR TROUBLE, so I know DARING THE BAD BOY will be a sure hit. Catch the excerpt below and enter to win a $10 GC in the giveaway! Disclaimer: This Entangled Teen Crush book contains references to drinking, sexual situations, adult language, and an intense bad boy hero who will melt your heart. Great. The rudest boy at camp just so happened to save my life. I hoped he wasn’t one of those types who expected me to be indebted to him for the rest of the summer or whatever. I looked away and coughed, water filling my mouth so I had no choice but to avert my head and spit it out. My cheeks felt hot, and I couldn’t believe I was embarrassed, but old habits died hard, I guess. He said nothing, just grabbed my hand and walked/ dragged me the rest of the way out of the water, until we were standing on the sandy beach. I heard feet thumping on the dock and I glanced up, watched in disbelief as the majority of my so-called friends and the boys from B7B ran off the dock. Not a one of them had stayed behind to see if I was okay. Were they scared they’d get in trouble? Would Jacob rat me out? He was the director’s nephew, after all. I needed to say something to him. I didn’t want to get in trouble. I didn’t want to be sent home, and I’m pretty sure he had the power to make both things happen. Before I could say anything, though, Jacob grabbed my shoulders and gave them a little shake so I’d look up at him. His eyes were dark, his mouth set in a grim line, and he bent his knees a little so our gazes were even. “You really all right?” he asked, his tone firm. I’d quit coughing, but my voice still came out slightly wheezy. “I’m fine.” My bones felt like jelly and I thought I might pass out from lack of oxygen, but yeah. I was great. He squeezed my bare shoulders with his big hands, his fingers sliding over my thin bikini straps, and I realized I’d never stood this close to a boy before with so little clothing on. A shiver moved through me, and I tried to take a step back for much-needed distance, but he wouldn’t let me go. “That was really stupid, jumping off the dock like that,” he said, his deep voice now full of irritation. “Trust me, I wasn’t trying to impress you.” I couldn’t believe I’d said that. But I was offended that he basically just called me stupid. I made an incredulous sound, one I usually saved for the privacy of my bedroom when no one else was around, and he sent me a look. I was reluctant to admit it was sort of a cute look, his dark eyebrows raised, as if he dared me to contradict him. “Are you going to write me up?” When he still said nothing, I continued. “You said you would earlier.” I glanced around, noticed that the dock was completely empty. Where was Kelsey, anyway? Did she leave me, too? “You want me to?” “N-no. O-of c-course n-not.” My teeth had started to chatter. I didn’t know if it was from the cold or the shock, or a combination of both, but I couldn’t make them stop. I didn’t want him feeling sorry for me. And that didn’t look like a towel. “Wh-what i-is it?” I wrapped my arms around my middle, my fingers brushing against my goosebump-covered torso. I couldn’t stop shaking. It was like I had no control over my body. He sighed and glanced to his left, then his right, like he wanted to make sure there was no one around before he stepped forward and stretched the dark fabric between his hands. “Don’t move,” he ordered, his tone bossy as he yanked the fabric over my head. I jerked against his first touch, but otherwise I remained still. It was a giant hoodie that he slipped over my head. Warm and soft and a little sandy from when he’d abandoned it on the beach. The fabric clung to my damp skin and the hem fell to my thighs, covering me from my neck to almost my knees. I shoved my arms in the sleeves but they were so long, they swallowed my hands completely, even when I stretched my fingers out. “I should p-probably take a shower.” I clamped my freezing lips shut. Why did I just say that? Showers meant naked, and I didn’t want to talk about getting naked with Jacob. Interested? You can find DARING THE BAD BOY on Goodreads, Amazon, and Barnes and Noble. Click on this Rafflecopter giveaway link for your chance to win a $10 gift card. Monica Murphy is the New York Times, USA Today and #1 international bestselling author of the One Week Girlfriend series, the Billionaire Bachelors and The Rules series. Her books have been translated in almost a dozen languages and has sold over one million copies worldwide. She is a traditionally published author with Bantam/Random House and Harper Collins/Avon, as well as an independently published author. She writes new adult, young adult and contemporary romance. She is also USA Today bestselling romance author Karen Erickson. She is a wife and a mother of three who lives with her family in central California on fourteen acres in the middle of nowhere, along with their one dog and too many cats. A self-confessed workaholic, when she’s not writing, she’s reading or hanging out with her husband and kids. She’s a firm believer in happy endings, though she will admit to putting her characters through many angst-filled moments before they finally get that hard won HEA.